During the Irish boom years it was always painted as a simple choice. Did we want to be closer to Boston or Berlin? But while our ego fuelled an inflated sense of self-importance as we reveled in the fact that Project Ireland was at last an economic success, we failed to see what was staring us right in the face. Now that reality has brought us crashing back down to earth it is time to forget Boston and Berlin, and start embracing the only country that can truly help us forge a solid economic future — Britain. America is without question a true and best friend but ultimately will always look after its own interests, and rightly so. Then there are the boys from Berlin who have recently shown their true colours as they continue squeezing every last ounce of dignity from the Irish Government to ensure German banks stay afloat while the Irish people foot the bill. But while Europe twists the knife it is Britain that has rested a hand of friendship on our shoulders while our other European ‘friends’ desert us. When the extent of Ireland’s financial crisis hit the headlines and Europe looked at how best to financially penalise the Irish people, the British parliament signed off on the Loans to Ireland Bill with little fuss. Meanwhile, as the IMF and EU handcuffed the Irish nation with astronomical debt, members of the European Parliament sniggered under their breath at the fact that Ireland, as they saw it, got what was coming to it. Now that our true relationship with our European overlords is transparent, it is time that we saw sense and strengthened our ties with the UK. The Queen’s visit last year was a huge turning point with regards to our modern day relationship with Britain. It allowed reconciliation with the past on both sides of the Irish Sea. However, most of all, it finally highlighted how our two sovereign states have more to benefit from by embracing each other rather than grasping onto the “us and them” mentality that for so long blighted our thinking when it came to Old Blighty or as some affectionately call it — the Mainland. Prince William last week said that the visit “opened new doors” for the Queen and hailed it as a “huge turning point”. Speaking as part of a BBC documentary he claimed the Queen’s enforced absence from Ireland due to the political tensions left her “like a child not allowed to go into a certain room.” It should be noted that it is Britain that is freely helping us pay the mortgage on that “room”. Rumours are warming up again that another royal visit should be expected shortly, and this will further help cement the relationship between our two countries. So, with our relationship with the UK stronger than ever, at last there can be open discussion about the possibility of joining the Commonwealth or ditching the Euro for Sterling, without cries of treason. Indeed, the question is — why can proud, successful and powerful nations, such as Australia and Canada, have no problem when it comes to benefiting from the Commonwealth and the resulting deep economic ties with the UK while Ireland has for years balked at the very idea? While we aspired to developing a Continental Café Culture during the Celtic tiger, the truth is we have always had more in common with our British neighbours. We speak their language, support their football teams, read their media, watch their television channels and hold many of their values. Our relationship with the British has indeed suffered from bad PR over many decades. But the sign of a mature, confident Ireland would be to re-embrace Britain and pave the way for our two nations to truly thrive by closer economic and political ties. The harsh economic reality has shown which nations we can rely on in times of crisis. 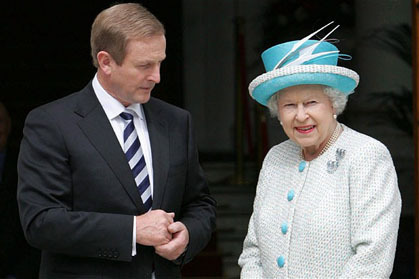 So as the Queen prepares to celebrate her Diamond Jubilee this year, it is time that we forged stronger ties with the UK. Whether this is by joining the Commonwealth, adopting Sterling or some other form of economic co-operation, is for the people to decide. However, one thing is for sure — the ‘800 years of oppression’ chip on our shoulder needs to be brushed aside. In fact, it is time that we treasured and loved the British as much as they do us.